Just a little over a year after the explosive climax to Rocksteady’s Batman Arkham series comes Telltale Games’ interpretation of the character and mythos with their own very different set of mechanics. But does this smaller-scale, more personal story of Bruce Wayne and the Batman hold true to the legend of the Bat? If you’ve played a Telltale Games release in the last few years, then you’re already familiar with the gameplay. In a modern streamlining of classic adventure game mechanics, you’ll alternate between choice-based dialogue, small puzzle-like investigations observing items of importance, and quick time event action scenes. These elements are all still very present in Batman as they are in previous titles, with varying degrees of success. As always, it’s the narrative and dialogue of Telltale Games’ titles that are their true defining features and Batman is no exception. While the overarching plot and themes are played a little too safe in this first episode, calling back to famous titles such as Year One, it’s the moment-to-moment character interactions and voice work that satisfy rather than disappoint. The story takes place early on in Batman’s career as he works to take down small-time thugs and mafia bosses, whilst slowly being introduced to some of his more iconic adversaries. Familiar faces like a pre-Two-Face Harvey Dent and Catwoman are given interesting introductions to jumpstart their relationships with Batman, as Bruce Wayne attempts to help Dent become elected as the new mayor of Gotham City. While Batman’s early years and introduction to classic villains has been done numerous times throughout the years, Telltale still manages to find ways to instill some tension into these moments, supported by engaging writing and intense decisions on how you want others to view both Bruce Wayne and Batman. These interactions are only bolstered by the impressive voice cast, with Troy Baker as Bruce Wayne and Batman, once again proving to be one of the best actors in the industry. Unlike the legendary Kevin Conroy most known for the role, Baker lends a bit of a vulnerability and youth to the character, a crucial element for this more inexperienced Batman, while still successfully tapping into the inner darkness that characterizes the Dark Knight. 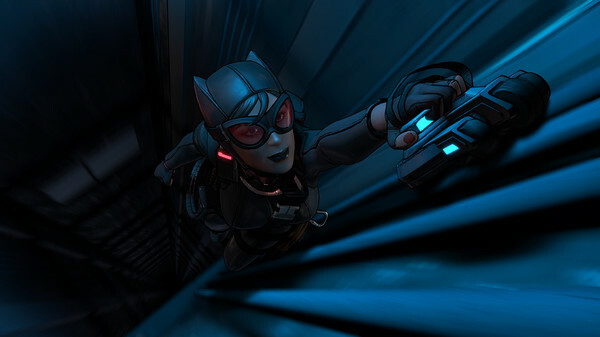 Supporting characters are all done expertly as well, with Travis Willingham’s Harvey Dent displaying charming charisma (hopefully to better setup his tragic downfall), Laura Bailey exhibiting both the seductive and dangerous sides of Catwoman, and even a surprising appearance of Uncharted’s Richard McGonagle as what is certainly one of the more memorable portrayals of Carmine Falcone. While this first episode undoubtedly isn’t one of the most original pieces of Batman narrative, it lays a firm groundwork for upcoming episodes, with a few interesting and novel threads that will hopefully open up the season to more innovative plotlines. It just wouldn’t be Batman without the detective skills though, which do translate decently to the standard Telltale formula of searching environments for items and clues. Having a character remark at a sword in Game of Thrones may not be the most gripping of gameplay, but makes much more sense as Batman relays information at a crime scene to his butler Alfred. 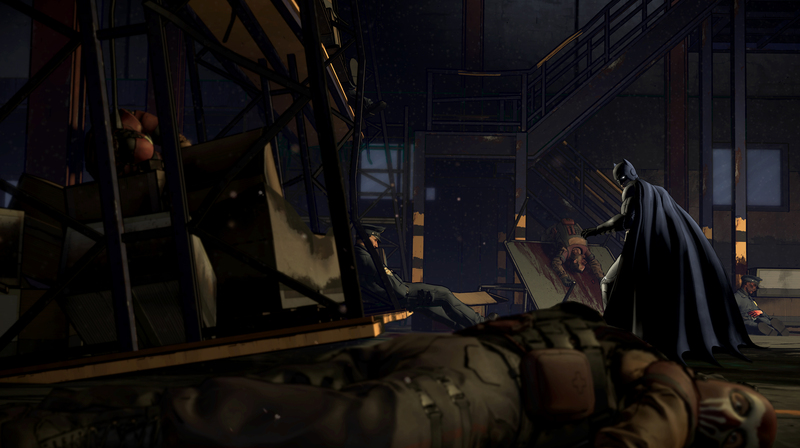 These slower-paced puzzle moments are given a bit more complication as well, as players must link together certain key eye-catching elements in the environment to deduce what previously occurred at the scene, much like the hologram crime scene investigations introduced in Batman: Arkham Origins. While the sequence was fairly simple in this first episode, it’s always fun to see Batman slowly piece together a crime scene, and there is room for this mechanic to be expanded and complicated as further episodes progress. A new additional puzzle mechanic was the introduction of Batman’s drone used to scope out and plan attacks on fortified areas. This action was again a simplistic one, as you simply choose the methods in which Batman can disperse of goons as he makes his way through an environment, but it is nonetheless entertaining to see Batman formulate a plan before playing through it in quick-time action. Hopefully this is another mechanic that will be built upon in new episodes. 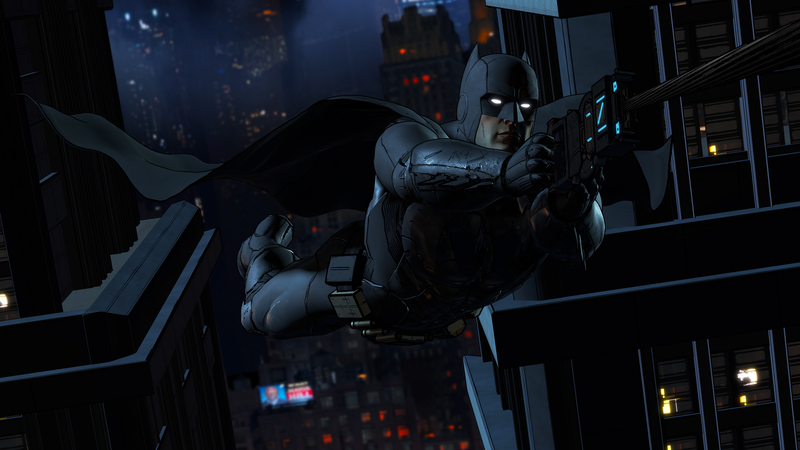 However, not all of Telltales’ signature gameplay fits well with adapting Batman. After the Arkham series introduced possibly some of the most engaging and fun combat and stealth in recent game history, to see these same actions be replaced with quick time events is disheartening. Telltale clearly understands what makes the character so enjoyable to watch, as he pulls henchmen into the shadows with his grappling hook, or effortlessly flows through a room of armed guards taking them all down, but the simple acts of button presses and control stick movements just don’t do the action justice. Fortunately, this is another area that has been expanded upon a bit for this new release, with a meter displayed on-screen throughout the action that builds up as players successfully perform the indicated responses. With the meter full at the end of a scene, Batman can unleash an exciting and amusing final move, which definitely helps to bring some added tension to the moment without breaking the flow of the cutscene. While not as noticeable during regular, slower-paced gameplay, the actions scenes also serve to illustrate Telltale’s reliance on their old and outdated engine. It manages to hold up better than the worst cases from earlier games, but its hiccups can really hinder the immersion or even frustratingly mess up a timed button press. I can’t help but wonder if we could have seen a much more robust and groundbreaking Batman game had the team experimented with a different engine, or even an entirely separate formula than their typical series. In the end, though I was initially skeptical of what Telltale could bring to the table with their own Batman game, this first episode has calmed those worries and left me excited and hopeful for new episodes. It would have been amazing if they had taken their chances with this series to experiment more and deviate from their traditions, but like most, I come to these games for the story, which left me satisfied and eager for more. Batman: The Telltale Series Episode 1 is a fine start to what could potentially be one of their best works.